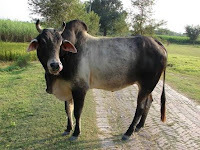 According to a recent analysis, expert estimates have suggested that there are a whopping 53 lakh stray cattle, mainly cows and bulls, in India. The analysis suggests that by banning slaughter of non-milching cows, especially in BJP ruled states, the farmers are now further facing a fresh ruination. As a result of this, it is pointed out, the farmers are faced with the grim reality that they are unable to sell off their cattle at a competitive rate. Consequently, they are being forced to abandon the cattle which face starvation. And, if the government decides to keep this cattle from dying, at the rate of Rs 100 per dayer cattle head, the it would have to shell out Rs 20,000 crore a year. In states like Maharashtra, whose large parts are reeling under drought, things are particularly bad. Farmers wanting to sell off their cattle -- including a healthy bull -- can't do it easily. They are unable to sell them, as there are very few buyers willing to buy them in the weekly market. A healthy bull, for instance, would have been swiftly sold four months ago, farmers in Maharashtra complain. Bit the beef ban has ruined everything. This is because, while the slaughter of cows has been forbidden in Maharashtra for four decades, it was recently extended to bulls and bullocks. The move has dramatically reduced the demand for cattle, worsening the plight of small farmers in the predominantly agricultural region of the state. A state which is notorious for farmers' suicide, in Maharashtra cattle provided a kind of insurance policy in times of extreme crisis. This is not so any more. Now farmers, who could sell their livestock to other farmers when emergency funds were needed or to butchers when the bovines grew old and unproductive, can't do it anymore. Three lakh cattle were slaughtered each month in Maharashtra before the ban was imposed four months ago. The farmer who would get Rs 35,000 for a healthy bull has to now settle for less it than half that, yet there it is not so easy. The Government of Maharashtra, which has imposed the harsh beef ban similar to that of Gujarat, has promised to set up shelters for aging cattle. But four months later the plans have not been realized. As for farmers, the shelters are of no use, as the shelters would only rid farmers of the maintenance cost. Across Maharashtra, with a population of 11.2 crore, an estimated 10 lakh were employed in the cattle industry. It is this section which has suffered alongside the farmers.